Comfort Soup – Crab Corn Chowder with … Bacon! I know, I hear you; I’m bringing back the bacon. As winter sets in, although it’s been pretty darn mild around here lately, and that’s not helping the ‘comfort food’ theme we have going on here, thick hearty soups are often on the stove. Here on the Island, with sales on crab meat going on, its time for some crab – corn chowder with a bit of… you asked for it… bacon! Cook the bacon over medium heat, remember I only use the Western Beef (add shameless sponsorship plug here lol) thick cut rashers. Add onions; sauté for a minute or so, until tender. Add corn, potatoes, milk, Worcestershire, and thyme; bring this to a boil. Reduce heat; simmer 30 minutes or until potato is tender. Combine cornstarch and evaporated milk in a small bowl; stir with a whisk to create slurry. 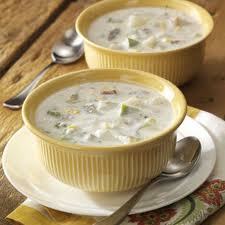 Add cornstarch slurry to soup to thicken it up; simmer 5 minutes or until thickened, stirring occasionally. Add mushrooms and crab; remove thyme sprig. Ladle into soup bowls; sprinkle with chives. I enjoy serving this with toasted rye bread and butter.